The sectors feature is available to Silver, Gold, and Diamond users. You can upgrade your membership to get immediate access by clicking here. There are a couple of ways to make use of the Sector data. One is to refer to the left panel of the SlopeCharts platform and, after choosing the Sectors data panel (which you access by clicking on the left or right arrows) you can explore the sectors and sub-sectors within. The ticker symbols themselves are organized within these lists, and you can copy any specific symbol to one of your own watchlists. If you want to return the list to its original state, click on the Sectors title at the top and choose Collapse All from the popup menu. You can scroll through the sectors (in alphabetical order) or search based on any text. For instance, by typing in “retail”, you can see any of the sectors with the word “retail” anywhere. You can check any of these, or to save time, you can click the Select All Shown button to checkmark every single sector displayed. When you are done with your choices, click the Apply button. 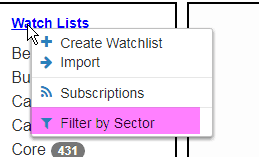 All of your watch lists will benefit from the filtering. 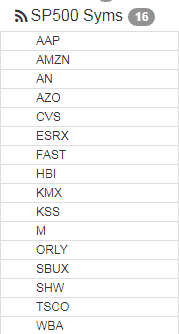 For example, if only “retail” sectors are chosen for the S&P 500 watch list, the list shrinks from 500 down to 16.